Reporting for Quality Management in industry. What are SCADA systems? SCADA is an acronym for supervisory control and data acquisition. SCADA systems are a kind of software used for data acquisition and process control through PLC technology or equipment with communication technology in the industrial control system (ICS). There is also a 3D interface feature in the SCADA software: transform 2D factory plan into a 3D OpenGL interface with objects associated with PLC tags. objects may be created in the supervisory software itself or imported from other systems. Get tutorial for training. Download from the official link for free here . The main HMI SCADA screen at development programming mode is divided into two parts: the bottom where there is a spreadsheet with the PLC tags and the top panel where visual HMI objects are placed to control data in real time. In runtime mode panels can be set to full screen. A full application can be developed through windows and panels, from the HMI SCADA to reporting, with the data acquisition and process control. Factory plants, control systems, screen panels navigation, web, etc... objects may be created to specific cases. 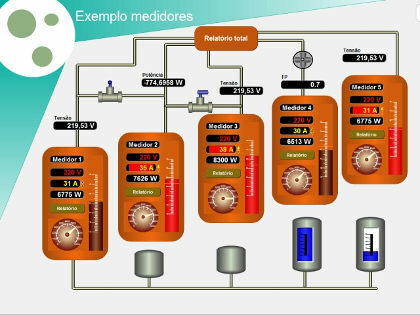 In this SCADA system, IN and OUT points are defined in a PLC tags spreadsheet to control the whole process in the supervisory system. Properties like equipment, PLC, variables, files, formulas, scales, etc... are defined for each case. Theses tags data can be stored in the SCADA database continuously or through systems events. They may be associated with the objects and reports. Limits are defined for each tag state generating alarms. 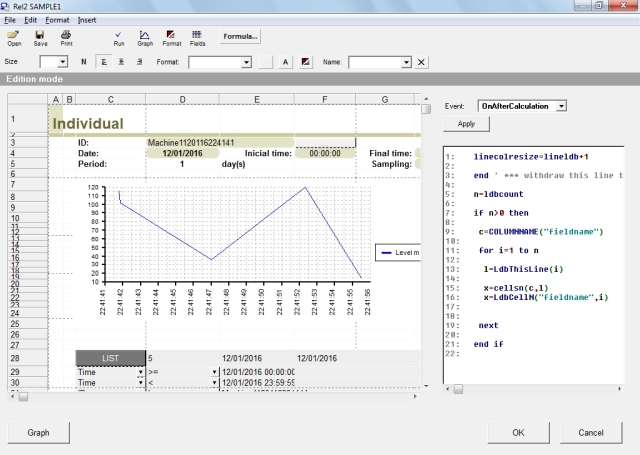 Formulas are used to calculate values for the data and define scales in SCADA systems. And to advanced cases, script programming can control these PLC tags. To specific cases, there is a possibility to create customized properties. On the HMI panel, visual objects may be used in the system both to control specific systems and also for simple data monitoring in real time for supervisory purposes. 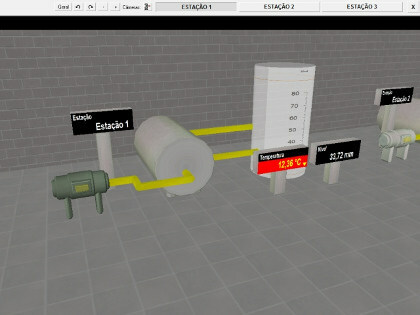 These objects can be developed inside the SCADA software or imported from other software. Some these objects are available with source for free. Each object can control the information from the defined tags in the tag sheet. It is possible to create and modify objects drawing with vector objects to specific cases. There is also an option for object script development system with open source SCADA solutions. Each object has properties and events that may be configured. Some of these objects can be exported to WEB monitoring. Scripts can be used in the SCADA systems processes programming to create specific applications using objects, PLC tags, databases and reporting. They are used to control tags behavior according to each process. There are several commands oriented to industrial automation. This script is a language for software development for windows 32 platform. Scripts may be executed inside events from objects or process. When setting a database in the tags spreadsheet, reports can be generated from the stored data acquisition for quality management, analysis, and charts with stored history information. These reports can be modified according to each case with a generic spreadsheet with cells, calculus and database listing. This spreadsheet is customized with database and formulas. Templates are also available to generic industrial needs and can be also modified. Scripts are used inside reports to create specific SCADA applications using calculation and analysis. 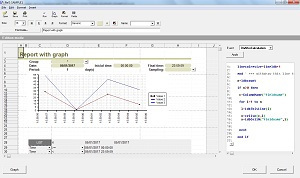 The SCADA also monitors the data through an integrated computer remote network in a distributed industrial control system (WEB or directly via TCP) in real time. Some objects are exported to HTML if WEB control is needed, and in this case, the SCADA software become a WEB server in parallel to the desktop system. A remote supervisory desktop version can be used without WEB using TCP. 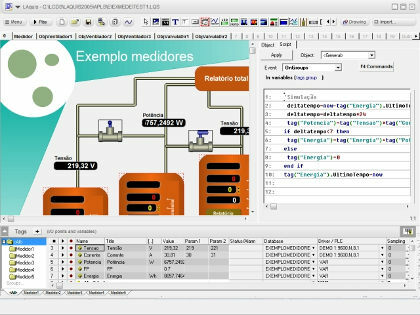 Exports visual objects and panels and reports and distribute to the PCs in the plant network system. SCADA security control is an important item to secure access to the industrial information. The industrial control system network must be controlled and can not allow unauthorized access. The SCADA systems are used to prevent this. Set the PLC I/O points or IIOT addresses on the tags spreadsheet at the bottom of the main screen. These tags may be generic or physical equipment data variables. Their values are numeric, text or digital. Data that come from equipment are transmitted using a several types of communication protocols according to specific systems. They are customizable according to each SCADA process. Some tags are defined by formula, association and script. Limits are also specified to control alarms. The PLC tags spreadsheet contains properties to control what will be read or written on the equipment by the SCADA system. These properties are also customizable. Some of the main properties are: Name, Title, Value, Unit, Driver / PLC, Database, Param1, Param2, Status, Formula, Limits, Alarm, custom, etc .... Each property can be a column in this PLC tags spreadsheet. Some columns are customized and added according to the application system. Choose the equipment driver to be used in the SCADA software in the Driver / PLC column. The driver can be set by dragging the mouse pointer with the left button on the Driver / PLC column, or by clicking on the Driver / PLC column title to select all tags desired at the group. Driver is the library that performs the communications with the equipment / PLC or specific function. Some of them are timers, clocks, scripts, sine functions, etc... The data acquisition from the PLC tags may be recorded to a file (database). This database is a flexible and customizable set of fields and records of the SCADA process. Each field can be a tag or generic value of the process. Data types are float, integer, text, byte, datetime, etc... Database may be proprietary binary files, dbf or text. Click on the database column. The database can be set by dragging the mouse pointer with the left mouse button on the database column (like it was done with the driver), or by clicking on the title of the database column to select all tags desired at the group. Data recorded from the SCADA system are used in reports through the button Report. 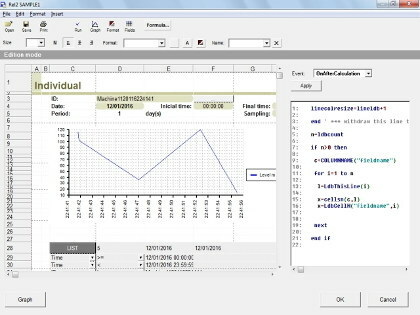 They are designed using a spreadsheet with functions and script oriented to database. A visual objects panel is located on top of the main screen. On this panel, objects and visual controls are designed and can be used as the interface for the user. These objects can be displays, pictures, animations, controls, etc... They are associated with the tags. They can be designed in the SCADA software through vector drawings, script or imported from pictures. These objects are placed on the panel. The panel is divided into pages/windows. Each page is selected according to each case. Vector object drawings also can be controlled by tags. 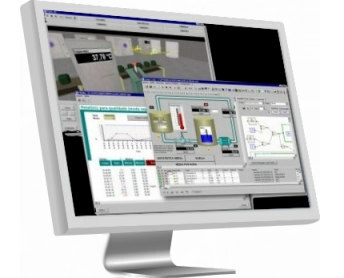 Executable applications present to the user the designed HMI interface system. Specific applications can be also developed through scripts for several kind of SCADA systems. They are executed within the available events in the SCADA software. Each object and process has events. Scripts are placed inside these events. Clicks, scanning, alarms, tags, etc... Scripts are sequences of instructions or programs used to customize the application's actions to control the process. This language is compiled in real time. Data from the PLC tags are accessed and controlled through scripts. The commands are oriented to industrial automation processes. It is possible to access and control every SCADA tag and its properties through script. There are also specific controls in the security area, an important issue for the SCADA systems. 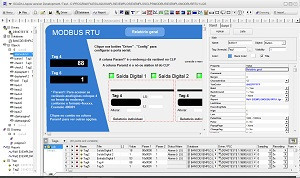 Try the all-in-one LAquis SCADA software for free. Click on tutorial for training. Create SCADA HMI visual panels with objects associated to tags. 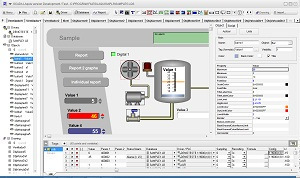 Develop PLC SCADA applications with a language oriented to automation. Draw in 2D and 3D HMI with special IDE tools for SCADA development.